As BP CEO Tony Hayward prepares for his turn in the hot seat in Washington, he can look forward to a seat made even hotter by top executives of rival big oil companies. BP already is a pariah among much of the American public for its role in the nation's worst oil spill, and now the rest of the industry is moving to distance itself from the company and limit the damage from likely increased federal regulation. 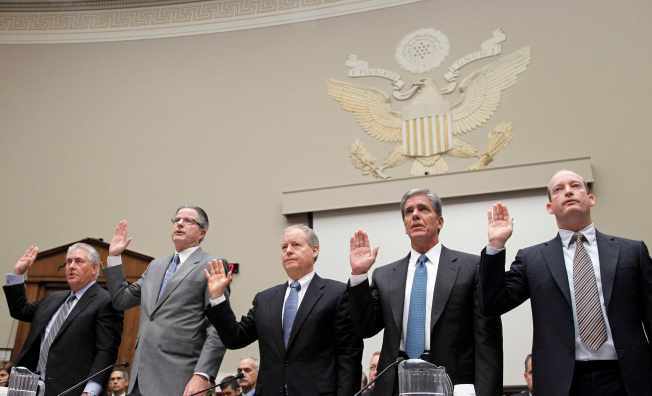 Top executives of BP's biggest rivals appeared before a congressional panel Tuesday and delivered the message: This disaster was caused by BP’s mistakes, not a wider safety problem with deepwater offshore drilling. BPAmerica President Lamar McKay, facing harsh questioning by members of Congress, was left to listen and apologize, saying, "We are sorry for everything the Gulf coast is going through." CEO Tony Hayward, who is scheduled to meet with President Barack Obama Wednesday and testify on Capitol Hill Thursday, likely will have to do more than just apologize. The White House has been pressing the company to suspend its $2.6 billion quarterly dividend and establish an independent fund to pay claims arising from the spill. Obama, in his televised Oval Office address Tuesday said he demand that Hayward "set aside whatever resources are required to compensate the workers and business owners who have been harmed as a result of his company's recklessness." BP’s mistakes have been well documented in news reports and internal records, including newly released documents showing that BP made a series of money-saving shortcuts and blunders that dramatically raised the risk of losing control of the well. One engineer ominously described the drilling project as a "nightmare" just six days before the blowout in April. Congressional investigators also found that BP was badly behind schedule and losing hundreds of thousands of dollars a day. The company responded by cutting corners in the well design, cementing and drilling efforts and the installation of key safety devices, investigators have concluded. Those findings have created a major fissure in an industry normally known for its solidarity on Capitol Hill. BP may be the target for outrage from Americans watching the widening spill threatening the Gulf wildlife and economy. But as Congress moves to crack down on Big Oil, BP is drawing even more scorn from the rest of the industry. Congress and the White House are mulling a number of options to tighten oversight of offshore drilling and put the oil industry on a shorter leash. On top of the list is a tougher set of rules on leasing and oversight of offshore drilling sites and tighter safety standards on oil industry operations. To the extent that slows down the exploration process, it will raise the cost of finding and producing new oil. Another change that has already generated political momentum would lift a cap on an oil company’s liability for spills from the current $75 million to as much as $10 billion. The cap was put in place after the 1989 Exxon Valdez oil spill to create a fund that would jump-start the clean-up and claims process once a spill occurs. Critics say the cap simply lets companies off the hook for the cost of catastrophic clean-ups. If Congress does lift the cap, it could create major headaches for the industry, including a sharp jump in insurance costs. “Costs are certainly going to go up with insurance premiums and maintenance,” said Steve Yerrid, special counsel to Florida Gov. Charlie Crist in charge of overseeing the state’s legal claims against BP. Big Oil also could face a bigger tax bill. As it reviews energy policy, Congress will pick up a decade-long debate over alternative energy that bogged down several bills during the Bush administration, which focused on developing new sources of oil. One likely flash point: a series of tax breaks that encourage deepwater offshore drilling, one of the most promising sources of new oil. Now that a deepwater well has unleashed the nation's worst oil spill, those tax breaks could be shifted to promote alternatives like wind, solar and nuclear power. Talk of raising taxes and tightening regulations doesn’t sit well with some members of Congress from oil-producing states dependent on the industry for jobs and taxes. Some are echoing Big Oil’s position that this was a single company’s failure, not an industrywide problem. But the massive spill has revealed the shortcomings of a drilling technology that was supposed to be “fail-safe.” Despite a long record of accident-free drilling, the oil industry has watched helplessly as BP repeatedly failed to stop the spill. Industry critics say the lack of effective solutions highlights the need to rethink the risks of deepwater drilling. BP’s failure to stop the spill also has created a gusher of bad publicity for the rest of the oil industry that is proving as difficult to contain as the spill itself. Round-the-clock video of crude oil spewing into the sea provides a constant, public reminder of the potential catastrophe posed by the next drilling project. BP may be making matters worse with its multimillion-dollar, high-profile ad campaign apologizing for the spill and making assurances that it will “make things right.” The blitzkrieg of print and TV ads only helps to keep the company’s failures in the public’s mind, critics say.